Cassini first discovered the jets of water ice particles in 2005; since then scientists have been trying to learn more about how they behave, what they are made of and – most importantly – where they are coming from. 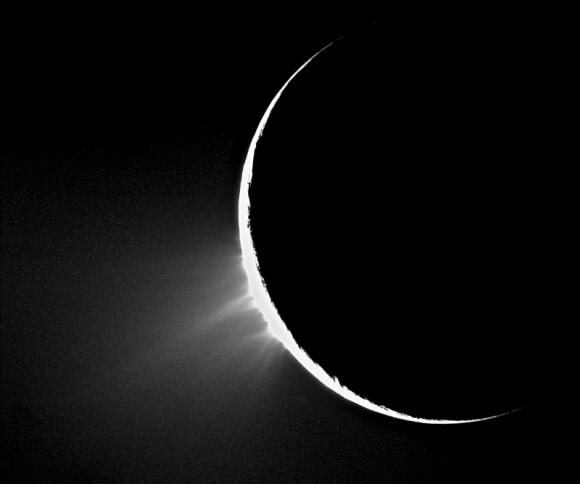 The running theory is that Enceladus has a liquid subsurface ocean of as-of-yet undetermined depth and volume, and pressure from the rock and ice layers above combined with heat from within force the water up through surface cracks near the moon’s south pole. When this water reaches the surface it instantly freezes, sending plumes of ice particles hundreds of miles into space. 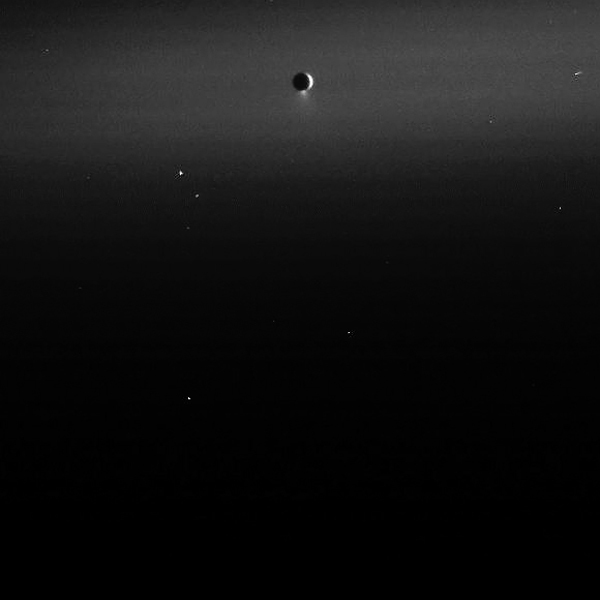 Much of the ice ends up in orbit around Saturn, creating the hazy E ring in which Enceladus resides. Although the discovery of the plumes initially came as a surprise, it’s the growing possibility of liquid water that’s really intriguing – especially that far out in the Solar System and on a little 504-km-wide moon barely the width of Arizona. What’s keeping Enceladus’ water from freezing as hard as rock? It could be tidal forces from Saturn, it could be internal heat from its core, a combination of both – or something else entirely… astronomers are still hard at work on this mystery. Now, using data obtained from flybys in 2008 and 2009 during which Cassini flew directly through the plumes, researchers have found that the particles in the jets closest to the moon contain large sodium- and potassium-rich salt grains. This is the best evidence yet of the existence of liquid salt water inside Enceladus – a salty underground ocean. Looking down into a jetting "tiger stripe"
If there indeed is a reservoir of liquid water, it must be pretty extensive since the numerous plumes are constantly spraying water vapor at a rate of 200 kg (400 pounds) every second – and at several times the speed of sound! The plumes are ejected from points within long, deep fissures that slash across Enceladus’ south pole, dubbed “tiger stripes”. Recently the tiger stripe region has also been found to be emanating a surprising amount of heat, even further supporting a liquid water interior – as well as an internal source of energy. And where there’s liquid water, heat energy and organic chemicals – all of which seem to exist on Enceladus – there’s also a case for the existence of life. Enceladus has intrigued scientists for many years, and every time Cassini takes a closer look some new bit of information is revealed… we can only imagine what other secrets this little world may hold. Thankfully Cassini is going strong and more than happy to keep on investigating! Plus, who knows… this may be one step closer to finding life elsewhere in our own solar system. All we need to do is stay diligent and keep looking. The findings were published in this week’s issue of the journal Nature. Read more in the NASA press release here or on Universe Today. Cool blog, great photos and sharp on the stories. 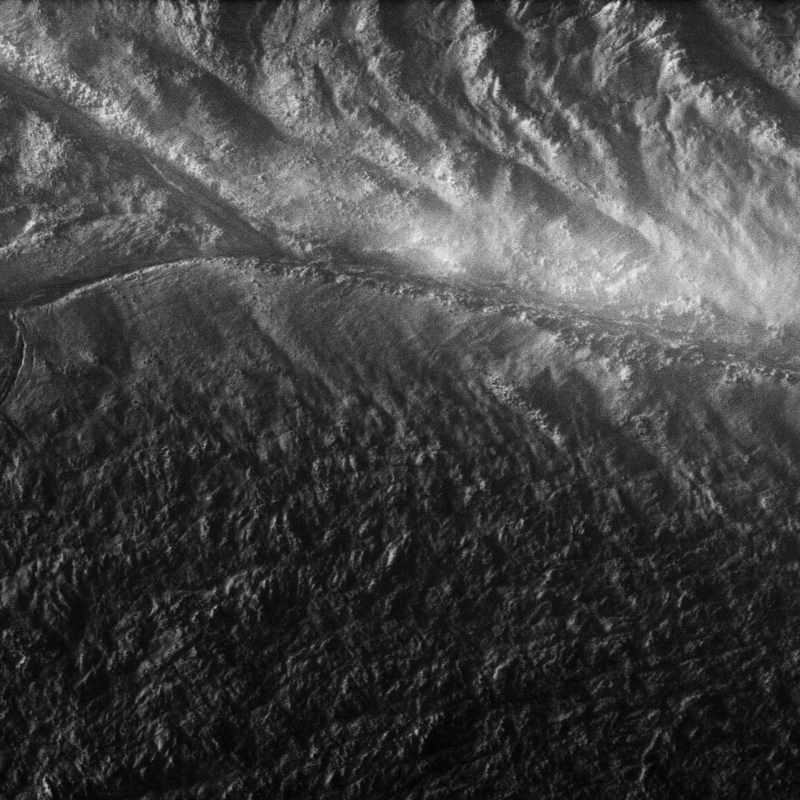 Are there any halophiles down there on Enceladus? Only time will tell.